The election of the new Superior General was preceded by two earlier phases: the “De Statu Societatis” and the “murmuratio”. The De Statu Societatis phase looked at the current state of the Society, and based on that outlined the profile of Superior General the Society needed. The murmuratio phase was a four-day period during which the electors had one-on-one conversations (murmurings) who would best fit the outlined profile. Earlier, on October 3, Father General Adolfo Nicolás had nominated Father James E. Grummer as Vicar. In that capacity, Father Grummer was charged with presiding over GC36 until the election of a new Superior General. On the morning of October 14, Father Grummer presided over the Votive Mass of the Holy Spirit in preparation for the election of a new General. 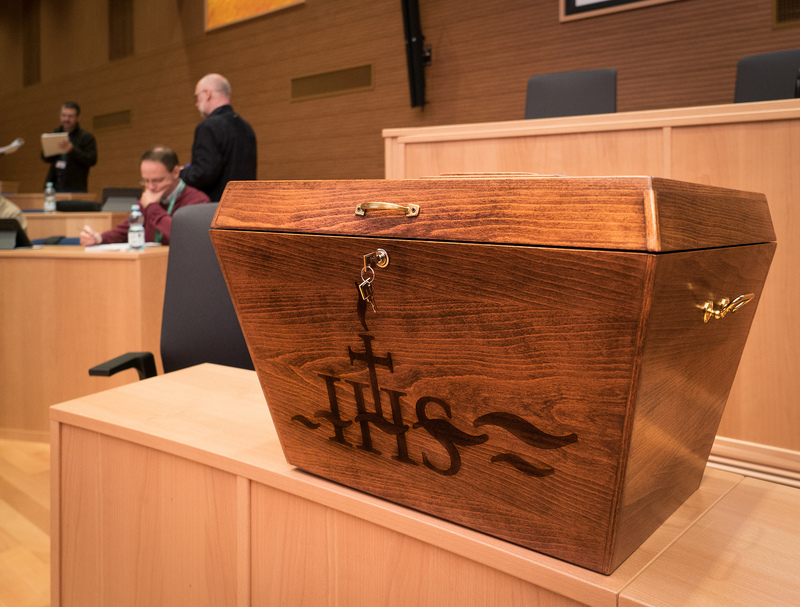 Consequently, and as Jesuit tradition demands the electors returned to the Aula to cast their ballots. Around noon, Father Arturo Sosa was elected the 31st Superior General of the Society of Jesus (see photos). On October 18, Father General Arturo Sosa had his first encounter with members of the media and at which he took some questions.